Student choreographers showcase their dance pieces at the Student Spotlight Spring Dance Concert. This year’s event is March 13-14 at Thunderground. Robin Williams, as South Beach nightclub owner Armand Goldman in the film “The Birdcage,” barks out a frenetic flurry of dance choreography: “You do Fosse, Fosse, Fosse!” as he turns in a classic Bob Fosse move, then directs another dancer, “You do Martha Graham, Martha Graham!” before voguing like Madonna. 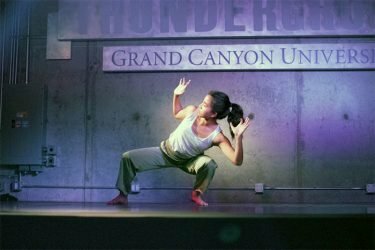 It won’t be quite as hyper-frenzied as that at the Grand Canyon University dance department’s Student Spotlight Spring Dance Concert, though attendees at the free-admission event – slated for 7:30 p.m. Tuesday and Wednesday, March 13-14, in Thunderground – will see all styles of student-created choreography. “‘Zest’ by Isiah Johnson is a fun, upbeat hip-hop piece. 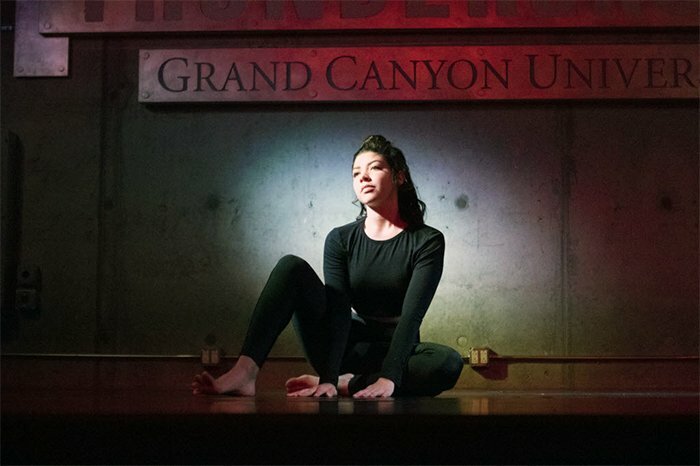 We have a tap piece called ‘Uttered,’ and we have a lot of contemporary ones,” as well as ballet, said Bekki Price, adjunct faculty member in the College of Fine Arts and Production. Each semester the dance program spotlights winter and spring concerts choreographed by faculty and guest artists. The Student Spotlight Spring Dance Concert is different in that it’s not only performed by students but choreographed by them as well. The concert is open to submissions by any GCU student, from freshmen to seniors. Dance and dance education majors put together a dance piece each semester and attend Work in Progress showings, where they present those works to faculty members to get feedback. “Then we hold an adjudication, which is like an audition, so each student will audition their choreography and, from there, we select the pieces,” Price said. 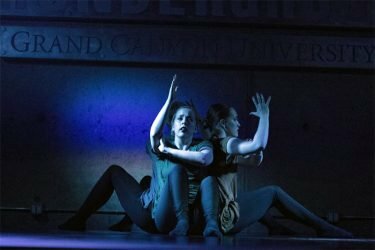 Eighteen works were selected for the Student Spotlight Spring Dance Concert. Dancers (above) perform Spotlight pieces in 2017. Eighteen were chosen to be part of the Student Spotlight. Two works from that adjudication process also were chosen to be included in the dance department’s spring concert, “The Tipping Point,” coming up April 13-14 at Ethington Theatre. Price said one interesting piece in the Student Spotlight is called “Am I Doing This Right?” Choreographed and performed by Sarah Tedeschi, the work is about what it’s like to be a woman and comparing yourself to women in pop culture. “Are you like what society expects of you? Are you always questioning yourself?” Price said of the work. She added that a lot of the submissions delve thematically into culture and identity, such as Dominique Brown’s hip-hop work, “Bask in Appreciation,” which she’ll perform to “Getaway” by the Salsoul Orchestra and “Komuz” by Mario MK. Price said another dance of note is a modern work called “Just as Equal,” choreographed by Maritza Palacios and Elizabeth Svorinic and performed to music by Aether, called “Eidolon.” It will feature dancers from the Central High School Dance Co.
GCU’s dance education students go into the field to teach dance, and “we like to have some of our partnering schools involved in our performance,” Price said. Audiences can expect everything from hip-hop to ballet at the Student Spotlight Spring Dance Concert. Besides giving students an opportunity to showcase their creative talents as choreographers, this event also gives dancers one more venue in which to perform and is an opportunity for student stage managers and others to refine their craft and become even more involved on the campus. Price said another thing interesting about the Student Spotlight is that it has a different feel from the other dance department concerts. “It’s not that its informal, but it’s just got a different vibe — it’s a fun vibe.,” she said, and it also fills up fast because spectator space in Thunderground is limited. “We encourage people to get there early,” Price said. “Snazzle-Raz-Ma-Taz,” choreographed by Alyssa Quiett in collaboration with dancers. Performed by Miriam Baker, Madeline Bosse, Turiya Chavez, Rylie Pryately and Ellie Sheldon. “Sage Advice,” choreographed by Khaila Matthews. Performed by Lauren Iuliano. “Lil Boat” by Jaidyn Vaughn. Performed by Joanne Aguirre, Dominique Brown, Maggie Bullar, Julia Geringer, Destiny Magee and Kianna Stallard. “two” by choreographer Estevaun Lauro. Performed by Cassandra McGehee and Ellie Sheldon. “life is peachy,” choreographed and performed by Miriam Baker and Guillermo Flores. “Uttered” by Abbi Cavanaugh. Performers include Emily-Rae Abang, Jenna Ballew, Maddie Brinker, Eleanor Jimenez and Anna Sanamyan. “Equanimity” by Isiah Johnson. Performers will be Amanda Keller, Madison Knutson and Jessica Symmes. “something green” by Lauren Iuliano. Performers are Madeline Bosse, Guillermo Flores, Isiah Johnson and Kiana Stallard. “Bask in Appreciation,” choreographed and performed by Dominique Brown. “Bad, Rare, Ordinary,” choreographed by Miriam Baker and dancers. Performers are Joanna Aguirre, Justine Bach, Maggie Bullard, Tyler Curry, Julia Geringer and Abigail Rodgers. “1943,” featuring choreography by Madeline Bosse, Julia Geringer and Kiana Stallard. Dancer is Madeline Bosse. “Just as Equal” (Tuesday night only) by Martiza Palacios and Elizabeth Svorinic. Performed by the Central High School Dance Co.
“Looking for –,” choreographed by Claire Schmaltz. Performed by Kylee Ernst. “Are You Game?” choreographed by Tyler Curry and performed by Hannah Ahr, Maggie Bullard and Carissa Eubank. “Rush Hour” by Anna Sanamyan with performers Madeline Bosse, Julia Geringer, Isiah Johnson, Kiana Stallard and Chesney Thompson. “Am I Doing This Right,” choreographed and performed by Sarah Tedeschi. “Manie Sans Delire” by Crystal Mora. Dancers are Joanna Aguirre, Hannah Ahr, Carissa Eubank, Alyssa Miller, Alli Ross and Alysa Sandoval. “Zest,” choreographed by Isiah Johnson. Performers are Madeline Bosse, Julia Geringer, Isiah Johnson, Melissa Morales, Anna Sanamyan, Kiana Stallard, Jessica Symmes and Grace Valega. Such a lovely and empowering person! I completely agree with what she advised us. Keeping our faith through the darkest moments is a battle worth fighting/dying for. I know people who have been through a rough life and some of them have been the most horrible people I have met. But when you keep your faith through it all, you will never let the dark break you. Define you. Change you. I am so grateful that GCU invited her. As a student, I strongly feel that the more connected we are with our world”s history, the more we will improve our present and future.